What does the father of the electric power industry in the Intermountain West, the gold mines of Telluride, Colo., and Central Utah Water Conservancy District have in common? 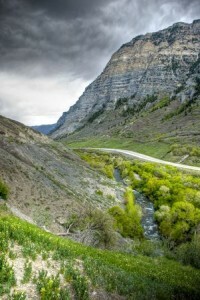 A wonderful history that will factor into the future of water preservation for a growing number of Utahns, that’s all! Since acquiring the Olmsted Hydroelectric Power Plant at the mouth of the Provo Canyon, “it’s unbelievable the amount of history that’s coming forward,” CUWCD Education and Outreach Director Monica Hoyt said. The structure first opened in 1904. “We’re find out more all the time, and it’s fascinating,” Hoyt added. Lucien L. Nunn, an Ohio lawyer who made his mark out West developing an alternative form of energy to replace coal in fueling work in Colorado’s gold mines, was the driving force behind it all. By the time he had moved to Utah, built Nunn’s Plant in 1897 and harnessed water from the Provo River, his original direct-current operation had grown into an alternating current capable of generating 40,000 volts. Thomas Edison said the concept was impractical and unstable. But it is reported that $50,000 in gold and a contract releasing him of any responsibility if it didn’t work convinced engineer George Westinghouse to lend Nunn a hand. Also key to the process were Nunn’s brother Paul and Paul’s assistant engineer, Fay (Fred) Deveaux Olmsted, who designed the plant that carries his name. He died of tuberculosis before he saw it finished, but he would certainly be proud. In time, the facility housed the Telluride Institute, a school Nunn created when he could not find enough qualified electrical engineers out west to further his operation. It also hosted the House of Ideas, a model filled with the latest appliances that its founders hoped would inspire more Depression-era Utahns to tap into its electrical output. But what most people remember, Hoyt said, is the “three-mile wooden flume, 10 ft. wide and 7 ft. wide” that carried water to the penstock. It was replaced in 1949 by steel piping, but the original flume became the stuff of legend. Keep watch, Hoyt said, as even more emerges about this iconic Utah landmark.